Here at Explore Wanaka we have personalised packages and custom tours to suit you. We have passionate local hosts each with over 20 years of experience in these mountains, who are stoked to show you their amazing back yard. We will organise the best resort for you on the day and the most suitable runs to suit your riding style and ability. From powder filled lines and user friendly free-ride terrain to the immaculate half pipes and terrain parks. Just enjoy shredding the mountain in its natural form, riding from top to bottom! That's easy and we will happily create a fun environment to do that! We know Wanaka's best kept secrets and stashes on the hill - and would love to share them with you. We tour Cardrona, Treble Cone and Ohau. Each uniquely special in its own way. Cardrona has world renowned freestyle facilities combined with rolling fun terrain and some steep slopes to please the more adventurous. 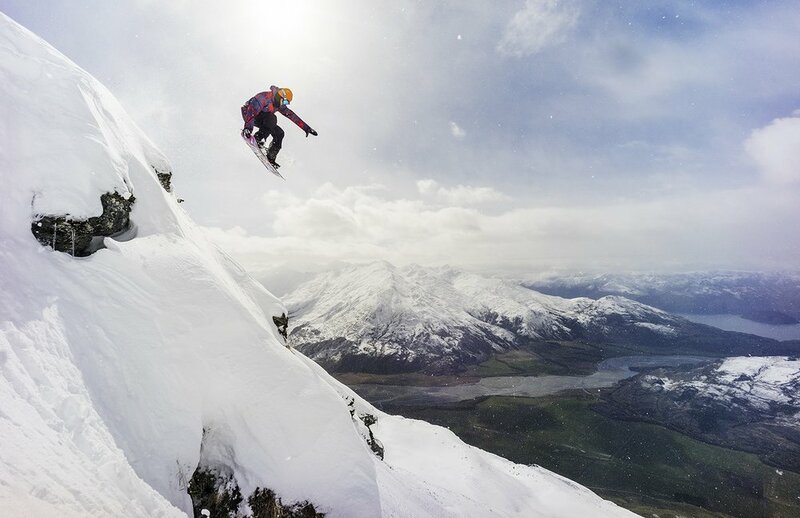 Treble Cone is incredibly spectacular, perched above beautiful Lake Wanaka, with some of New Zealand's steepest terrain mixed with fun gully shoots and open bowls. Ohau is a smaller, less commercial, resort that gives you a true kiwi experience with great hiking access and fun terrain. The combination of these three resorts creates a truly rounded NZ snow holiday with a good mix of what's on offer here. We look forward to sharing this unique part of the world with you and creating your ultimate winter holiday! Please inquire below and we'll happily discuss your itinerary and pricing options and work with you to create your ideal custom package. Cardrona is without doubt New Zealand's most progressive and world class training facility for freestyle skiing and snowboarding. It boasts a massive amount of rider friendly terrain with options for all and includes two half pipes and numerous terrain parks. Not just a freestyle resort, 'Cardies' on a 'pow' day is legendary! Score it on its day and it's as fun as anywhere in the World! Its accessibility to Wanaka makes it a real favourite for locals and visitors alike! Combine that with international events and this really is a mountain that stand outs from the rest. Cardrona is family-friendly and caters to all abilities and with facilities to compliment there's truly nothing that compares. Come and experience it and you’ll see! Treble Cone has, without a doubt, one of the most spectacular views from a ski resort anywhere in the world - hands down! We may be a little biased as we live in Wanaka but we'd be very surprised if you’d disagree! Treble Cone, or TC as it’s more commonly known, is a freerider's dream and has to be at the top of any winter travellers list. With natural terrain as far as the eye can see and options galore, this is the place to be for any rider wanting a good freeride challenge, to rip the chutes, to drop in to a powder bowl or to hike the summit! Do any of these and you'll be sure to get the ultimate TC experience! A good day at TC rivals an amazing day anywhere in the world. Its friendly atmosphere, wide, open space and that breath-taking view this place needs to be experienced to be believed! Ohau is one of the beautiful hidden gems tucked away in the Southern Lakes region. It's been a long-time favourite at Explore Wanaka for good reason. Ohau has that small club feel with a friendly family vibe, its easily accessed from Wanaka and the surrounding region. The terrain is wide open, user friendly and if you don't mind a small walk the runs can be very rewarding. What really sets its apart from the rest are its stunning and beautiful views that are on offer, a back drop that is truly world class an can be seem from everywhere on the mountain, did we mention the Ohau Lodge located on the very edge of Lake Ohau? No trip here is complete without stopping in there and visiting this legendary establishment. Apre Ski never had a better view if you asked us. Enjoy getting away from the crowds an having abit of space to open things up - Trust us you will love Ohau.